Early detection of lung cancer IS OUR MISSION! PAULA’s Test can help identify lung cancer in the earliest stages when treatment can be most successful. At Genesys Biolabs, we are focused on early detection of lung cancer using PAULA’s Test, an affordable blood test which can identify lung cancer risk even at the earliest stages of development. Lung cancer is one of the most common types of cancer and is known as a “Silent Killer”. Most cases of lung cancer are diagnosed late, after developing quietly for years and eventually spreading to other parts of the body. PAULA’s Test can help you know your risk now, when early detection may greatly improve treatment options and chances for a successful outcome. Statistics show, lung cancers detected early can be survivable in up to 80% of cases. Everyone gets blood tests. PAULA’s Test uses a standard blood collection method just like other tests your doctor already orders. 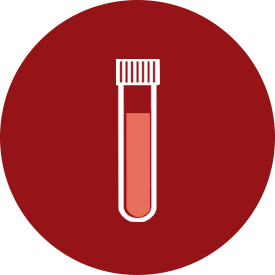 When you order PAULA’s Test, we send you a collection kit which you take to your doctor. When your specimen is drawn, send it back to our lab using the pre-paid shipping container provided. It’s really that easy. Is this a genetic test? What do I do after getting my results? Do you have information I can review with my doctor?